A 53 year old woman undergoes routine mammogram, during which a 2.1 cm spiculated mass is discovered. Core biopsy shows a bland spindle cell process which is positive for vimentin and CD68 and negative for keratins, SMA, and CD34. 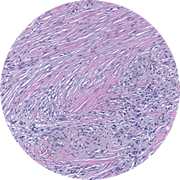 The core diagnosis is “spindle cell proliferation” with a recommendation for complete excision. Upon complete excision, the mass is shown to be well circumscribed along some edges and infiltrative along others. The center is hyalinized and the periphery is mild to moderately cellular. There are no mitoses. There is no necrosis. The architecture varies from storiform to fascicular. Immunostains show that the fascicular areas are positive for panCK, Cam5.2, CK34betaE12, CD5, p63, vimentin, and focally for SMA. 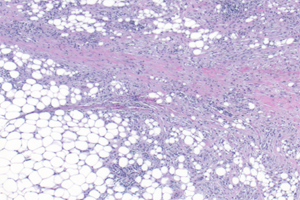 The neoplasm is negative for CD34, S-100 protein, desmin, and factor XIIIa. There is no malignant epithelial component. 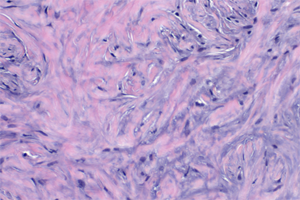 Based on the infiltrative borders and the spindled cells which are positive for especially CK34betaE12 and p63, a diagnosis of metaplastic sarcomatoid carcinoma, spindle cell type, low grade, was rendered. The tumor was ER, PR, and Her2neu negative. Ki67 was 1% positive.